The master illusionist has booked a theatre in your home town for his next show, so make sure to buy the tickets as soon as possible as this is a performance you will not want to miss. Watch the magician perform some unbelievable tricks in front of the packed theatre and enjoy what should be a one-of-a-kind experience. Considering the illusionist has promised to reward anyone who can uncover how some of his tricks are being performed, you could even earn some money in the process. True Illusions 3D slot has been designed to celebrate the intriguing profession that has been extremely popular ever since the 15th century. 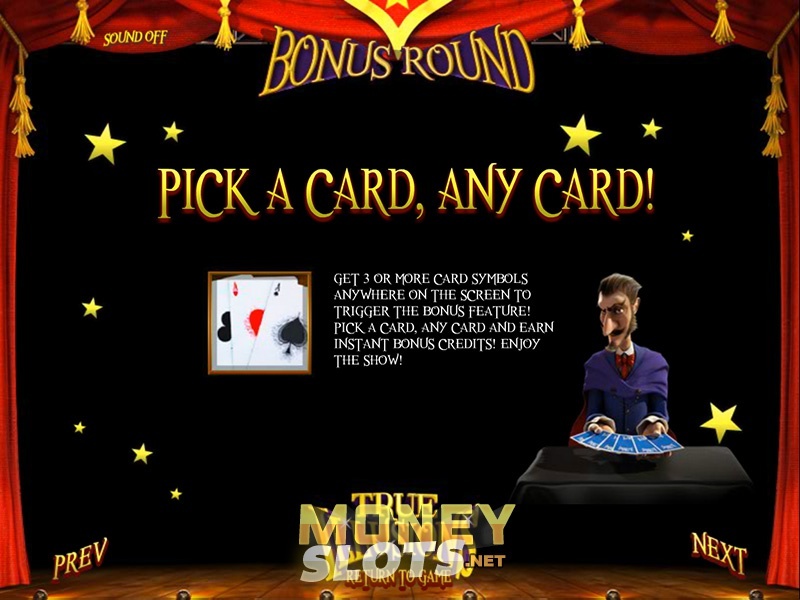 Playing the slot game will make you will as if you are actually attending a magic show, with all the most popular tricks being shown in stunning detail on the game screen. Just to make things a bit more interesting, game developers have introduced Stacked Wilds, Free Spins Mode and Bonus Round. With cinematic experience enhanced by the illusionist performing tricks next to the reels and great animations every time a winning combination occurs, chances are you will thoroughly enjoy playing True Illusions. Hot female assistant, coffin, guillotine, golden coin, dove, crystal ball, hat and linen populate the reels as regular game icons, whereas Wild, magician and playing cards are there to further boost your line wins. True Illusions has all the regular game options that have become a fixture for Betsoft 3D games, with choose coin, bet per line and select lines allowing you to bet anywhere from $0.02 to $75 per single spin. Wild icon substitutes all other game symbols with the exception of magician and playing cards, but that is not its only purpose. Get three stacked Wild icons on the central reel and Wild Reel will be unlocked. This will turn the entire reel 3 Wild for up to 7 spins. Three or more Magician Scatters anywhere on the reels trigger free spins mode, where the reels descend for each spin of the reels. At least three playing card icons in any position on the reels unlocks the bonus round. You are then required to pick cards for instant prizes. Female assistant symbol carries the highest coin jackpot of 2,500, but coffin and guillotine icons also award payouts in excess of 1,000 coins.